After a week of radio, social media contests and “Caught Cold” giveaways, over 100 lucky winners crowded inside the Legends Room at TD Garden for a chance to see four trophies from the major Boston sports teams – Bruins, Celtics, Patriots, Red Sox. 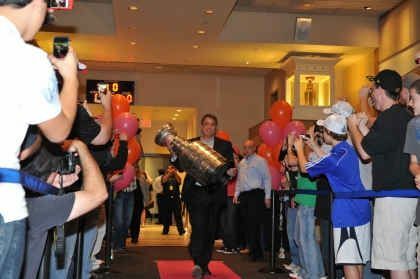 After his grand entrance amongst cheering fans, Cam Neely answered a few questions and talked about his championship experience as President of the Boston Bruins. Tom Caron, an anchor on NESN, entertained the crowd during the afternoon with sports trivia questions and giveaways. 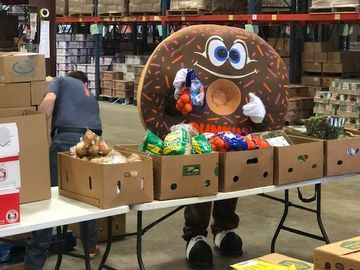 Throughout the event, winners sampled Dunkin’ Donuts new fall flavors products. 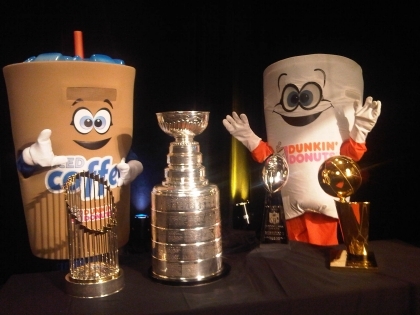 All of the guests took their photo with the trophies, including the Dunkin’ Donuts mascots! 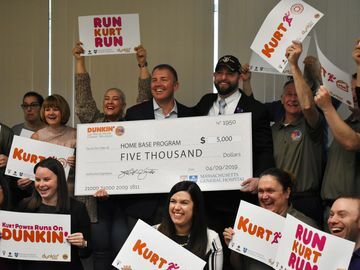 What a day it was for Dunkin’ Donuts and Boston sports fans. If you weren’t one of the lucky ones who won a ticket, you can experience the day yourself by taking a look at this video. Do you love Dunkin’ Donuts, sports and a chance to win free tickets? 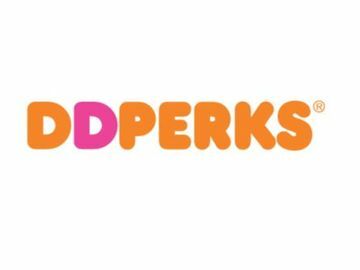 Dunkin’ Donuts is celebrating a year of “Caught Cold” ticket giveaways and extending the promotion through the fall to include Bruins and Patriots tickets. Want to get “Caught Cold”? Follow @DunkinBoston on Twitter for more information.